The Museum has offered teen programs that change the lives of young people for over thirty years. 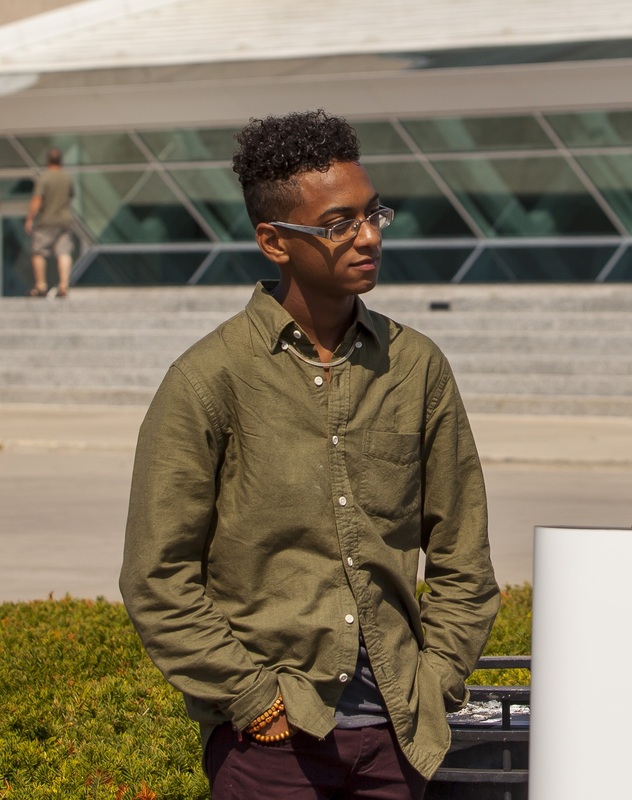 I’m thrilled to feature an interview with one program alum, Jesús Hilario, who is a senior in high school at Rufus King High School in Milwaukee. 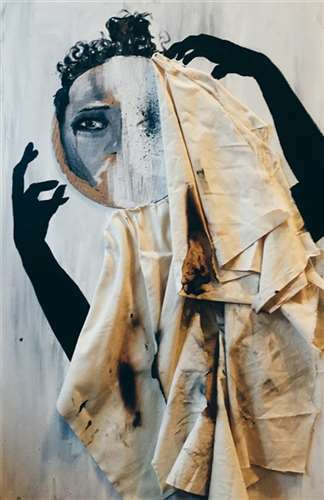 Jesús was an intern in the Museum’s ArtXpress high school program in 2013, and is a recent multi-award winner for the national Scholastic Art Awards, on view at the Museum through March 22. ArtXpress is a summer studio internship program for teens, who take inspiration from the Museum’s feature exhibition to create a mural that positively addresses a community issue and is displayed for a year as an advertisement on a Milwaukee County public bus. The Scholastic Art Awards is a national program that has encouraged the artistic endeavors of young people throughout the United States for over eighty-five years. Jesús, tell us a bit about the works of art you submitted to the Scholastic Art Awards and the inspiration behind them. “MaSCA.ra” (which means “mask” in Spanish) represents a journey. Many of us mask ourselves in one way or another. No matter what the reason, we unconsciously play with identity, because we are allowed to show others what we want to disclose. For example, we construct personas on social media, whether it is on Instagram, Twitter, or Tumblr. My work discusses the relationship between the mask and one’s true identity. I also explore the idea of spiritual warfare, or struggle with self and the disconnection between flesh and spirit. NO [below] also received a Gold Key as well as a 2015 Wisconsin Regional American Visions Scholastic Art Award Nomination [ed. note: The national judges give one “American Visions Award” to an outstanding work in each region. Regional judges nominate 5 works to be considered for this honor]. This piece communicates at a more universal level. I think that everyone has encountered an experience where they have been told “no, you can’t do this” or “no, you can’t achieve this”. 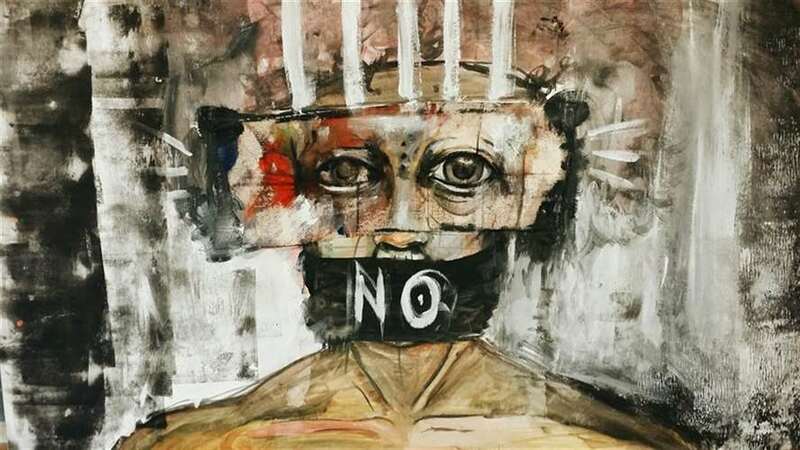 This work delves into being caged or constrained by that one person or an ideal, and also being constrained by one’s self and the inability to overcome something. What I tried to communicate with this piece is that we as a society metaphorically cage one another, by creating stereotypes, or through racism. I use art as a form of self-reflection and as a way to communicate and connect with the soul. I am interested in art because it is my passion, and because it is a way to effectively communicate to an audience in a visual and a universal way (without the restraints of language). Tell us about your experiences making art. When did you start creating art? What experiences have you had in and out of school that helped you develop your art style? I’ve always been creating my entire life, but in high school I began to see art as a form of communication and as a form of growth. I’ve always loved painting, although I began to experiment in other mediums during my sophomore year. I began to screen print with the help of RedLine, a community arts space and gallery in Milwaukee. Thanks to my involvement there, I created my clothing line Hilario, for which I screen print designs on clothing. Because I was thinking about the theme of masks, I’m now using fabric as to mask the flesh in my recent works. Then I began creating masks out of cardboard pizza circles that come in frozen pizza boxes. Ultimately, it is my intellectual focus that unconsciously decides what my style transforms into. Who are your favorite artists? Have they influenced your style of artmaking? Right now, my favorite artists are Kehinde Wiley and Mark Rothko. Recently, I’ve been working on pieces dealing with race and identity which have been directly inspired by Kehinde Wiley’s work. Mark Rothko has influenced the way I communicate with my audience. To me his fields of color represent emotions and a progression to through stages of feelings. In my own work, I try to communicate that this is a journey, that this is me getting over such and such, and that this is me conveying my thoughts and emotions through different stages. Has having internships and art experiences at the Milwaukee Art Museum influenced your artmaking at all? If so, how? Yes it has. The internship I did two years ago, ArtXpress, allowed me to discover the works of Kehinde Wiley, who as I stated before is one of my favorite artists. That year, ArtXpress was connected with the 30 Americans exhibition, which was one of my favorite exhibitions. 30 Americans introduced me to ideas of identity, as well as the use of fabric/fur and unconventional items to relay a message. Now I use fabric and unconventional items, such as cardboard pizza circles as I described above, as a way of expressing the theme of masking. 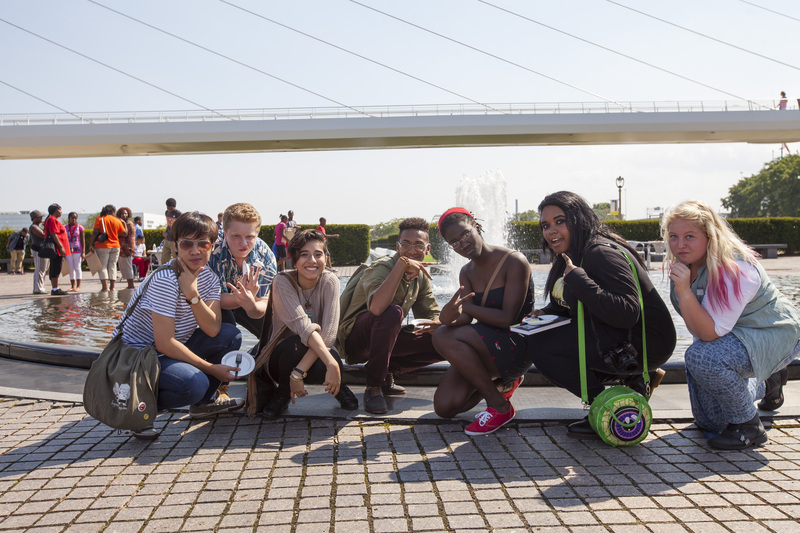 What have you taken away from being part of out-of-school programs in the community at the Museum and at RedLine? I’ve learned many things in my experiences with RedLine and MAM. 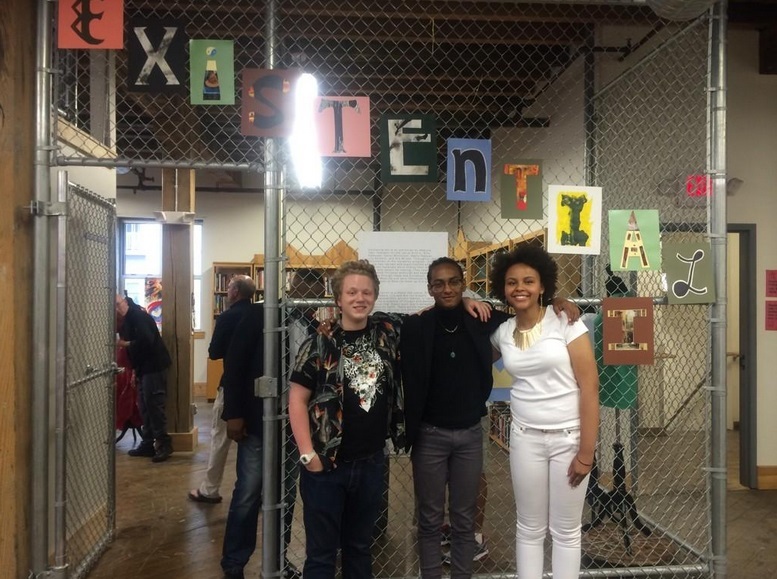 I’ve learned a lot about curatorial work through Art Xpress and through the Existentialism show I was a part of at Redline. I learned the importance of effectively displaying art work, and how it affects viewers. I learned how to screen print through Redline, and that is a skill I use a lot. Ultimately, I’ve learned many intangible things that I believe have set me apart from others, especially when it comes college. My participation with these programs has gifted me with a versatile array of skills. I am truly grateful for the experiences I’ve had with the Museum and RedLine. I hope for many things in the future. In the short term, I plan on going to college at The School of the Art Institute Chicago. I’m very excited for that. Also I plan on re-launching Hilario with new ideas and designs in mind. And I plan on graduating from high school, of course! In the long term, after college I plan on starting my own business while working at the Art Institute. Also, I want to travel a lot and experience new things. I want to create community centers where youth can come in and do art in any form, where they would be provided with all they need. And as an artist, I want to get my work in as many galleries and museums as possible. I want to communicate my ideas with as many people as possible. In essence, I’m just hopeful for the future and hope I am blessed with many things to come. This entry was posted in Behind the Scenes, Education and tagged scholastic art awards, Teen Programs, teens in museums, young artists. Bookmark the permalink.